~ The Mottershead Family Tree, with Photos and Memories through the Branches of my Family. Annie Mottershead was born in Cheshire, England, in 1921 and at the age of thirty, after witnessing the horrors of World War II in their home country, Annie, her husband and three young daughters decided to make a fresh start in Australia. Growing up in a predominately female family, Annie’s interest in fashion naturally led to sewing. After the war years, with three daughters to clothe, Annie would sit beside the wireless each night listening to her favourite shows, whilst hand sewing dresses for her daughters. Arriving in Australia in 1951 with few material possessions, Annie continued to hand-sew clothing for her girls. Around the mid-1950’s, once the family had ‘got themselves on their feet’ in their new country, a newspaper advert caught Annie’s eye for a Pfaff sewing machine. She couldn’t resist the opportunity to own her very own, time saving, electric sewing machine! The Pfaff 30 is a straight sewing machine (there is no function for zig-zag or fancy embroidery stitches) which requires a basic presser foot. Other foot attachments included are an edge stitcher with a quilting gauge, a zipper foot and three different sized hemming feet. A new dress for Jo – from the family photo collection. A few years after Annie purchased her Pfaff, I was born. 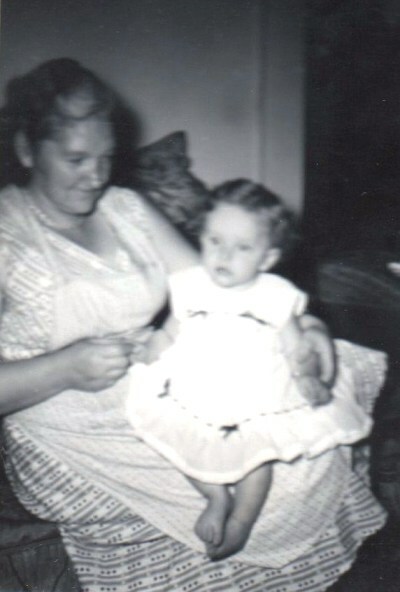 Being the fourth daughter of a very talented seamstress, I reaped the benefit of Annie’s expertise and always wore beautiful new dresses as a child. While growing up, I loved to watch my mother sew at her machine. She constantly reminded me not to put my fingers too close to the needle while the machine was in use, as she had once had the needle sew right through her finger! The incident happened when Annie was in the process of making bridesmaid dresses for my eldest sister’s wedding. Needless to say, a trip to the doctor was the only way to extract the needle, while Annie was left with a painful memory. Many more beautiful wedding outfits were created by Annie throughout the years and she always took care to keep her own fingers clear of the sewing needle. Annie was often complimented for her talent in sewing. Lacking formal training, she nonetheless could make any garment for any occasion, choosing beautiful fabrics to complete her creations. My sisters’ and I hold many happy memories of the selfless hours our mother spent at the sewing machine, making clothes for all of us. The original sewing machine manual and accessories tin. It seemed a natural progression, due to my interest in sewing, that my mother should teach me to sew. Using her Pfaff sewing machine, during my teenage years, I made a number of outfits for myself (with mum’s help, of course!) which later led to a lifelong career in manufacturing school uniforms in my own business. The reason why my mother and I shared such a depth of enthusiasm for sewing remained a mystery until the advent of the internet, which allowed me to research my family history. Dotted throughout my mother’s maternal family, I have discovered a wide array of relatives, both men and women, in the sewing industry, including garment dyers, jacket machinists, shirt finishers, sewing machinists and basic dressmakers. Annie treasured her sewing machine her entire lifetime. After her four daughters were grown, she continued to sew and the simple straight sewing mechanism suited her home decorator requirements. Annie enjoyed changing the appearance of the rooms in her home as the seasons changed, by making different coloured curtains and cushion covers with her Pfaff. Neatly tucked away inside the sewing table. None of my three older sisters showed an interest in sewing, so when mum passed away I was the lucky recipient of her sewing machine. 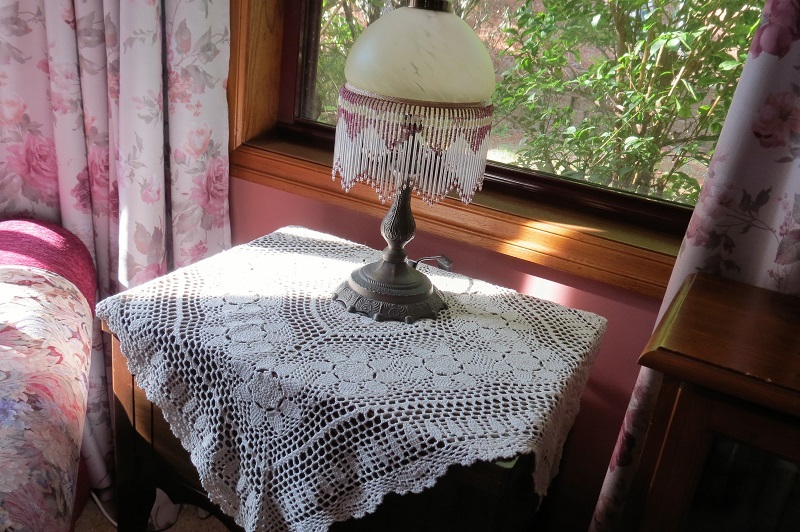 My mother had found a lovely, old style sewing table for her machine which I inherited with the machine and for the past twenty-three years (almost to the day, as I write) I have treasured and admired my mother’s sewing machine in my own home. 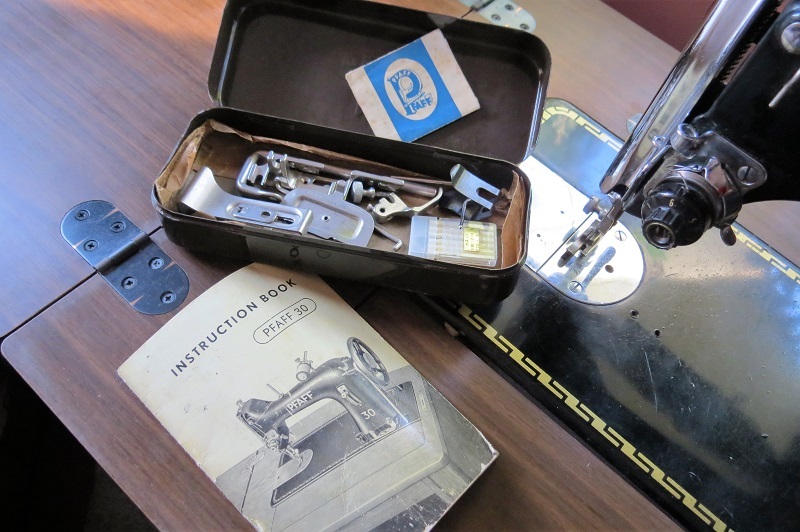 I still have the original case the sewing machine came in, along with the instruction book and tin of attachments. Occasionally, I pack the machine into its carry case and take it to a sewing centre to have it serviced and as a result, the machine still sews beautifully! 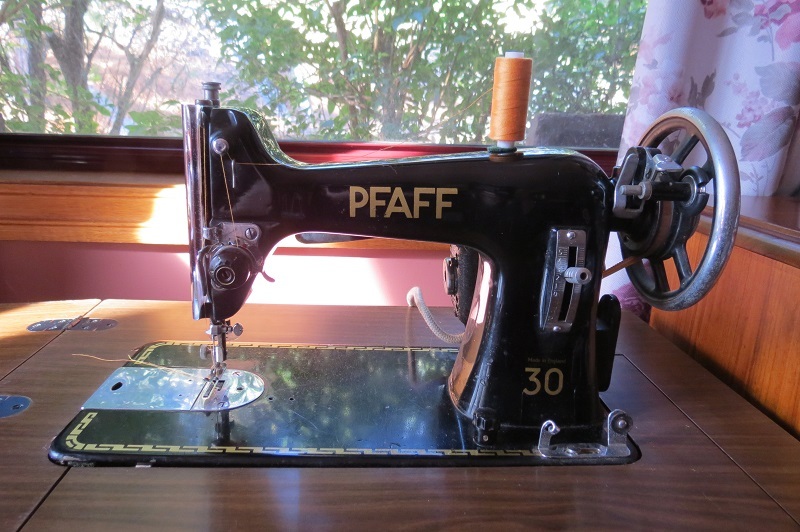 I have a number of sewing machines which I have bought myself, but mum’s Pfaff will always be dear to me. The straight sewing stitch is ideal for quilting, a hobby that I have enjoyed for years, in fact, one of the first items I made on mum’s Pfaff as a teenager was a quilt, made out of various fabric scraps mum had stashed away over the years. My youngest daughter is now the proud owner of that quilt. My mother’s Pfaff sewing machine has continued to be loved and used in my family for over sixty years. It isn’t only the practical use of the sewing machine which makes it a priceless possession, but also the memories of a lifetime. I loved reading this, Joanne! My paternal grandfather was a tailor before he became a farmer and all his four daughters grew up to be seamstresses. One of my aunts also made most of my clothes. My sister and my daughter also enjoy sewing but I guess I didn’t get that batch of genes – I could never get the hang of it. Subscribe to this blog and as new family members are added, you will be notified by email! The Family of Jo Mottershead by Joanne Mottershead Keevers is licensed under a Creative Commons Attribution-NonCommercial-NoDerivatives 4.0 International License. Based on a work at jomottershead.com. All content of this website is copyright. You may copy any content for private use, but for all other use, you must seek permission from Jo Mottershead Keevers using the form supplied on the "Contact Jo" page.